In 1958, the beginning of the decline of La Nuestra – the skill-based, extravagant and truly unique brand of football which had characterised Argentine football – could be traced back to one fateful game. It was in Helsingborg, at the World Cup, and the result was a 6-1 humbling against Czechoslovakia. The defeat, for some, brought with it an epiphany. The age of beautiful football, they insisted, was over. Argentina was falling behind. The naivety and dogma that had characterised their humiliating World Cup exit could not continue. With change now inevitable, La Nuestra was cast aside in search for a new identity. More importantly, a way of playing that would bring success. Three coaches were called upon to oversee the 1959 Copa; José Della Torre, José Barreiro and Victorio Spinetto. It was through the influence of the latter that anti-fútbol would eventually ascend into the mainstream. Spinetto stressed the importance of simply winning. His passion was not for attractive football, but for the pleasure of victory, in whatever form it took. His tactical innovations, simplistic as they may seem in modern terms, advanced the theories of anti-fútbol in its early stages and laid the foundations for the coaches that would later take it further. Osvaldo Zubeldía, whose Estudiantes side of the late 1960s were famed for their use of anti-fútbol, almost to a literal extent, was the most notable disciple of Spinetto. And those who Spinetto influenced went on to influence the next generation of coaches. Amongst those coaches was the most significant descendant of the early purveyors of this controversial, in the eyes of some, parasitical, tactical development. Plenty opposed anti-fútbol, but it had spread, and the man who brought it to the world stage was the unscrupulous, notorious, Carlos Bilardo. Carlos Salvador Bilardo was born on 16 March 1939 in the La Paternal barrio of Buenos Aires. His parents, Sicilian migrants from Mazzarino, stressed to him the importance of education and, unlike many who have been single-minded in their pursuit of football, he did not neglect his studies. He recalled the life-changing decision with such casual nonchalance, yet had he opted for a different career path, football history – certainly in Argentina – would likely have taken a notably different shape. In the early days of his playing career, Bilardo was an attacking midfielder. He showed promise in offensive areas as a youth player but gravitated towards a defensive midfield position, where he established himself as a regular at San Lorenzo. Two years in the capital were followed by four at Deportivo Español, but it was in joining Estudiantes in 1965 that Bilardo’s reputation as a player was formed, and where his coaching principles began to manifest. The same year, Zubeldía – 38-years-old and as yet unheralded – joined the club. He had impressed in charge of Atlanta but had failed in a brief spell as coach of the national team. Yet he was starting to earn a reputation; a disciplinarian who demanded relentless hard work and incessant, repetitive training drills. Zubeldía was studious and meticulous in his analysis of the game, but it was the cynical, destructive nature of his Estudiantes side that ultimately overshadowed all else and contributed to the largely negative reputation of anti-fútbol in Argentina. Bilardo was at the heart of it. It would be a mistake to view Zubeldía’s team as entirely brawn over brain. There was an intelligence, a great deal of detail that went into the tactical setup and strategies regularly utilised. Then, of course, there was the innovation of the aggressive offside trap, something unseen in Argentina prior to its use by Estudiantes. But for all the shrewdness, there was an inescapable dark side. Estudiantes were inherently and overtly confrontational, almost criminally combative. The deeply ingrained motto of winning at all costs soon became exactly that, and with little regard to the rules or the wellbeing of their opposition. This was pragmatism at its most hard-headed. Bilardo, the chief destroyer in midfield, was alleged to have often carried pins onto the pitch to jab at unsuspecting opponents. “You don’t arrive at glory through a path of roses,” said Zubeldía. 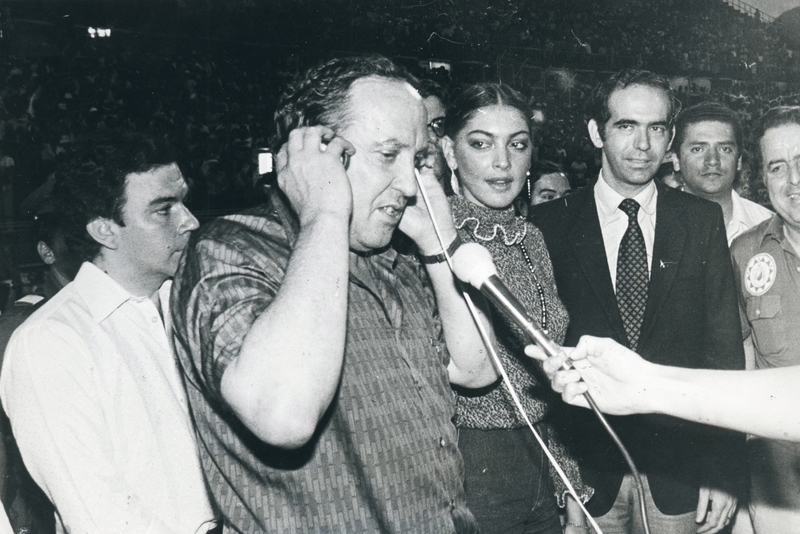 It is clear that Zubeldía was a major influence; the major influence for Bilardo. He was an unwavering apostle of his coach’s approach, regardless of the legality or morality of it all. And he would take that into his own coaching career with an entirely unapologetic, bullish attitude. For Bilardo, though, there was nothing to apologise for. “The match has to be won, and that’s the end of it,” he once said. His statements were nothing if not unvarnished. There are numerous tales of his antics in an Estudiantes shirt. The commitment and dedication to achieving success were certainly commendable, but some of Bilardo’s actions were deemed unforgivable. He was said to have once used his background and contacts in gynaecology to taunt Racing’s Roberto Perfumo about a cyst his wife had recently had removed. Perfumo, it is said, responded by kicking Bilardo in the stomach and seeing red. The battles were not just psychological. The Intercontinental Cup meeting with Manchester United in 1968 was a notoriously violent affair, and one that saw Bilardo embroiled in a two-legged confrontation with an unrestrained, maniacal Nobby Styles. “In one incident, I turned my back and he kicked me up the arse,” Bilardo recalled. “One of many kicks. But my philosophy was always that sometimes you give and sometimes you receive. If it was tough, you put up with it. Never speak after the game, never cry to referees.” If he had done so, it would have been almost comically hypocritical. By the time he ended his playing career in 1970, still at Estudiantes, Bilardo had completed the first stage of his anti-fútbol education. He had learned and developed his own ideas, won three Copa Libertadores and an Intercontinental Cup. Next he would make his own indelible mark on Argentine football by taking anti-fútbol to another level. “False,” Bilardo insisted. “We did eat chicken.” A curious clarification, you may be thinking, but a necessary one. It has been a long-standing myth that Bilardo, in all his fastidiousness, had banned the consuming of chicken at the 1986 World Cup in Mexico. It was believed to have been an act of superstition, but he has vehemently denied it. Still, such perceived idiosyncrasies only serve to enhance the intrigue surrounding his persona. It quickly became clear, as he became more prominent as a coach, that he was not typical, a non-conformist with little concern for the opinions of his detractors. In 2003, after he had been appointed as Estudiantes coach for the third and final time, Bilardo was said to have tracked down a woman who had wished him luck prior to an earlier 4-1 victory, and insisted upon calling her before every game that followed. “There’s absolutely nothing unusual in what I do,” he proclaimed. Many disagreed. What few could dispute, though, by the end, was his irreversible impact on Argentine football. The early years of Bilardo’s managerial career were spent honing his skills, building his reputation in a nation still diametrically opposed between the surviving remnants of La Nuestra and the continued emergence of anti-fútbol. An ardent advocate of the latter, Bilardo began, unsurprisingly, at Estudiantes, succeeding his mentor, Zubeldía. At this point, he was still helping his father run a furniture business and practicing gynaecology in his spare time. Then came a move to Deportivo Cali in Colombia, before a return to former club San Lorenzo, which preceded a spell in charge of the Colombian national team. He resumed his seemingly unending affiliation with Estudiantes in 1982, winning the Primera División title. A year later, he was offered the opportunity to take on the most significant and most daunting job of his career – that of the Argentina national team. From the outset, there was controversy. Bilardo had replaced César Luis Menotti, the philosophical romanticist, considered his antithesis. Menotti had led Argentina to World Cup success in 1978, but departed after the disappointment of 1982. To go from one to the other was a jarring shift, although Bilardo was at first complimentary of the work done by his predecessor. The two met in Seville in 1983, and enjoyed a largely agreeable conversation. But Bilardo’s decision to ignore Menotti’s advice and leave Alberto Tarantini and Hugo Gatti out of his squad for a friendly against Chile lit the fuse of a long-running feud. Menotti wrote a damning article in Clarin, and the two were from then on established as adversaries. Argentina embarked on a tour of Europe in 1984, and it was in those games that a sense of cohesion appeared, a team ethic that had been previously absent. Perhaps more importantly, however, the tour also allowed Bilardo to experiment with his innovative 3-5-2 system. He claimed to have invented the formation, though that is likely an embellishment. But it was certainly a bold, and successful, stroke of imagination. The football was typically efficient and unspectacular. 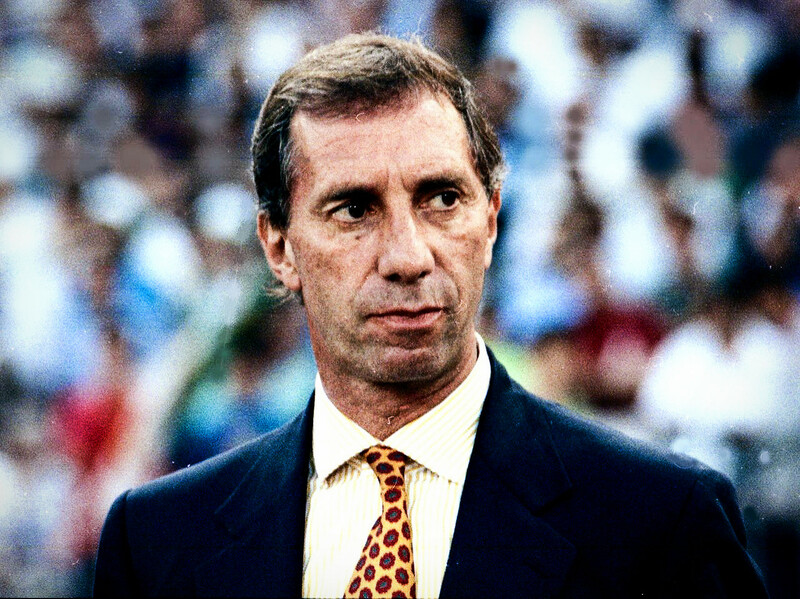 Bilardo was aware that he had talented players at his disposal in Jorge Burruchaga, Jorge Valdano and Diego Maradona, the most potent attacking options in the squad. And he knew that restricting them would be unwise. His system was designed in an attempt to find the perfect balance between structure and attacking flair. Seven players would defend, three would attack. It did not always make for flowing football, but it was unquestionably effective. Bilardo’s side, inspired by the fundamental brilliance of Maradona, progressed to the final – at times unconvincingly – where they defeated Germany 3-2. A feature of Bilardo’s Argentina side was that they repeatedly did the bare minimum, just enough to secure a victory, often when it appeared they were playing poorly. But then, that’s all that really concerned the unsentimental coach. Not that he was concerned in the slightest by the immorality of the goal. No, what played on Bilardo’s mind the most in Mexico was the nature of the two goals his side conceded in the final against Germany. Both were from corners, and both were, in his eyes, calamitous lapses in concentration and tactical discipline. “After beating Germany, I was very angry and couldn’t celebrate,” he said. “Somebody asked me, ‘Carlos, but what’s going on?’ And I answered, ‘They scored two goals from set pieces. With the number of times we had practiced and emphasised their moves, they still scored two goals from corners!’” Still, though it may not seem to be the case, Bilardo later claimed that winning the World Cup was “the greatest moment of my life as a coach”. Some called for Bilardo to resign even after the success, but he didn’t. Instead, he stayed until the next World Cup. Before that, though, the relatively uninspiring football continued. Argentina were eliminated in the semi-finals of the 1987 Copa América, which they hosted, and again struggled in the tournament in 1989. Bilardo led his side to the final of the World Cup a year later, an impressive feat in itself, but Argentina were beaten 1-0 in a scrappy and cynical game against West Germany. It was a final that encapsulated the term anti-fútbol and brought an ironic end to Bilardo’s time in charge of the national team. In a way, it was both the most successful and most contentious period of BIlardo’s managerial career. He later went on to more exotic locations, to coach Guatemala and Libya, after spells at Sevilla and Boca Juniors. But Argentina was where the intrigue lay, the most memorable years in the life one of football’s most memorable coaches. Pragmatism and idealism, Anti-Fútbol and La Nuestra, Bilardisme and Menottisme. All were considered opposite ends of the spectrum in Argentine football, opposing approaches to the game that divided a nation. Representing each were Bilardo and Menotti. The former, a tracksuited, unconceited pragmatist, a student of the founders of anti-fútbol, a man with no concern over aesthetics, just focused on winning and little else. The latter, a chain-smoking, erudite romanticist, an outspoken liberal, an advocate of beautiful football and freedom of expression. The reality, though, as is often the case with such distinct dichotomies, was far more multi-layered and complex. There is a perception that the two represented, in effect, good vs evil, that Bilardo was entirely opposed to any joy in football and that Menotti was undyingly devoted to entertaining the people, as if in some footballing utopia. As with almost all coaches, there were cross-over points. Occasionally, Bilardo’s sides were capable of exciting, attacking football, occasionally they were not entirely shackled. Menotti’s sides, meanwhile, could be equally pragmatic and were certainly not pure, innocent law-abiders. It remains a pertinent discussion, perhaps now more than ever. Great importance is placed on a coach’s style and where it lies on the spectrum. But often there is no definable place on the spectrum; in many cases, there are areas in which styles of different coaches overlap. 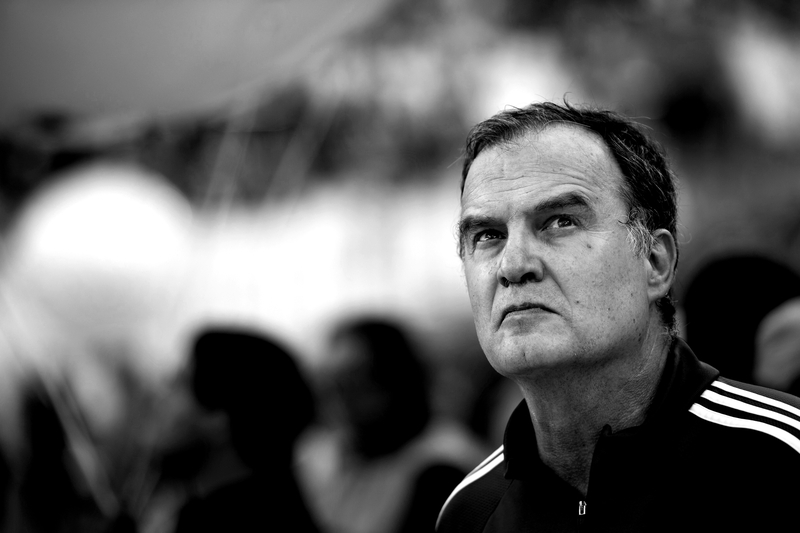 In Argentina, Marcelo Bielsa introduced what was almost a third way of playing, one that had drawn influence from both men. There remains a sense, though, that coaches are pigeonholed, often simplistically and superficially regarded as being on one side or the other. Diego Simeone, for example, has long been considered a disciple of Bilardo, but as Euan McTear points out in his book Hijacking La Liga: How Atletico Madrid Broke Barcelona and Real Madrid’s Duopoly on Spanish Football, “he is more Menotti and Bielsa-esque when it comes to tactics than many seem to think”. 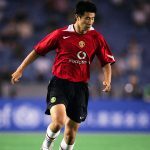 The debate between pragmatism and idealism is an important one, certainly, and there are clearly coaches that stray to one side more prominently than the other. But it has often been oversimplified to suit the arguments of those looking to detract the stylistic or strategic approach of an opposing coach. Bilardo himself had a public perception, and it was perhaps not entirely unwarranted. But his comments on the modern game in a 2005 interview offer a very different viewpoint. “The quality of play has definitely deteriorated over the years,” he said. “Not one player, not even in the Brazilian national team or the Spanish team for that matter, could be described as truly creative. Modern football is all about running. Technique is a foreign word. Evidently, Bilardo, despite how he was often portrayed, was not intent on seeping all of the enjoyment out of football. His passion for winning and his unerring competitiveness may have outweighed his desire to entertain, but the term Anti-Fútbol does not tell the whole story. In truth, Bilardo was a character just as nuanced as the true parallels between idealistic and pragmatic football.